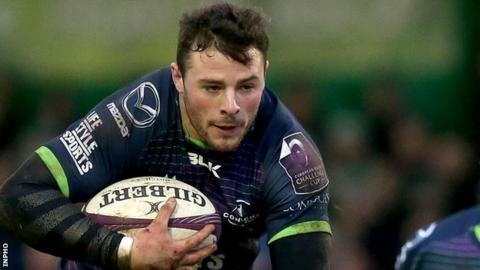 Robbie Henshaw handed Ireland an Six Nations fitness boost as Connacht thrashed Enisei-STM 47-5 to reach the European Challenge Cup quarter-finals. Fit-again centre Henshaw claimed one of Connacht's eight tries as Pat Lam's side finished as Pool One winners. Matt Healy crossed twice, with Henshaw, Tiernan O'Halloran, Denis Buckley, Danie Poolman, Tom McCartney and Caolin Blade also on the scoresheet. Vitalii Orlov claimed the Siberian visitors' solitary score. Battering-ram midfielder Henshaw had not featured since suffering a broken hand in November, but his return will boost Ireland boss Joe Schmidt's Six Nations resources. Connacht: O'Halloran, Poolman, Henshaw, Aki, Healy, A. MacGinty, Marmion, Buckley, Heffernan, White, Dillane, Muldowney, Muldoon, Connolly, Masteron. Replacements: Parata for O'Halloran (70), Carty for A. MacGinty (51), Blade for Marmion (57), Bealham for Buckley (51), McCartney for Heffernan (51), Ah You for White (53), Naoupu for Muldowney (59), S. O'Brien for Muldoon (61). Enisei-STM: Gaisin, Baranovs, Kacharava, Babaev, Simplikevich, I. Kushnarev, Shcherban, Volkov, Gasanov, Zykov, Saulite, Krasylnyk, Orlov, Temnov, Rudoi. Replacements: Kuashov for Shcherban (42), Serkov for Krasylnyk (47), Pronenko for Temnov (65). Not used: Selskii, Polivalov, Sidorov, Simonov, Butenko.